Littlest Pet Shop Blythes Bedroom Playet. 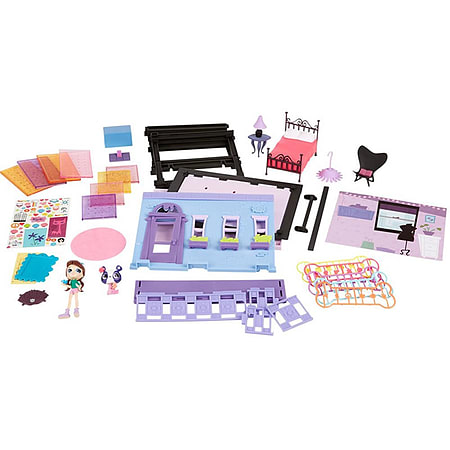 Design your Littlest Pet Shop world your way! The Blythe Bedroom Style Set comes with more than 95 pieces that let you design your world any way you want! Pieces include customizable wall panels, reversible scene backdrops, stickers, accessories, and Deco Bits pieces: unique plug-in pieces that add color and glam to your sets and your pets! This set also includes Blythe doll and Penny Ling pet (panda). All Style Sets are inspired by iconic locations from the Littlest Pet Shop animated TV show. They are totally stackable, vertically or horizontally, so you can build your world in any direction!